How much does it cost to the Algerian government and taxpayer to support the lost cause of the separatist Polisario Front? The amount is undoubtedly so huge that even the dreaded military intelligence services (DRS) of General Mohamed Lamine Mediène, aka Toufik, are not able to give an accurate assessment. This bothering question haunts the corridors of power in Algiers but very few dare to raise it publicly. One of these very few, a former Algerian minister, was bold enough to pose the question at a public meeting, at the risk of his own life. The former Minister of Trade might actually have the same awful fate as the late President Mohamed Boudiaf who was assassinated immediately after he voiced his resolve to open a new page in relations with the Moroccan neighbor and put an end to the longstanding Western Sahara conflict. The late president had been cowardly murdered on June 29, 1992 in Annaba, by an agent of the DRS, just six months after his appointment to the presidency. 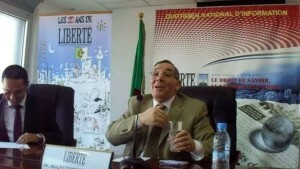 At a forum held Tuesday by the Algerian daily “Liberté”, former Algerian Minister of Commerce and former president of the Algerian Renewal Party (PRD,) Noureddine Boukrouh, described, with his well-known outspokenness, as “unacceptable” the obstinacy of the Algerian regime to continue to support the separatist thesis of the Polisario. “How much do this (Sahara) cause and this longstanding problem cost us? Can we afford to continue supporting this cause?” wondered Boukrouh, who is author of several books. “What’s happening in the country is not normal, it’s just madness,” he was quoted by the Algerian media as saying. Boukrouh also called Abdelaziz Bouteflika’s regime to abandon its sterile wrongheadedness regarding this case while Morocco did recover its Sahara. Focusing directly on President Bouteflika, Boukrouh said “there is no genuine political map in Algeria. Someone is pulling the old, worn-out strings behind the scenes” and this someone “is none other than Abdelaziz Bouteflika, President of the Republic who conducted a holdup of the Constitution,” he said.